The mairie has been busy since the weekend, constructing the quay-side beaches which make their appearances annually in July and August, for approximately 4-5 weeks. When I passed by this evening along Voie Pompidou, the landscapers were busy putting in the final touches while anyone unauthorised were barred from entering Paris Plages. Trucks and trucks of sand have been brought in, new lounging chairs set in intermittent distances, and shower areas set up too. Now, nobody’s allowed to swim in the Seine (and I’m not sure if anyone would really want to either, without taking on the risk of disease) so the beaches would be use mainly as sand pits and sunbathing spots. However, there is also a floating pool near Pont Marie for a quick cooling dip and aquagym. And over at Bassin de la Villette, I believe there would be an artificial wave good for surfing too! 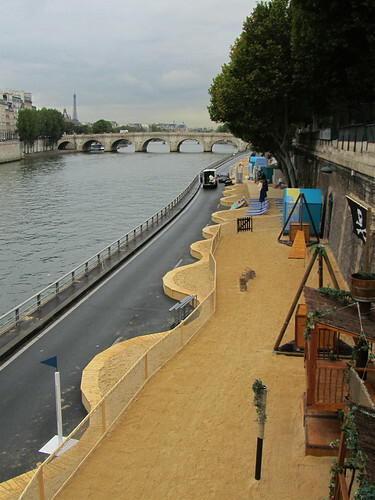 Paris Plages 2011 runs from 21 July to 21 August at Voie Pompidou, Hôtel de Ville and Bassin de la Villette. Click here for the full programme. the beach is gone now!